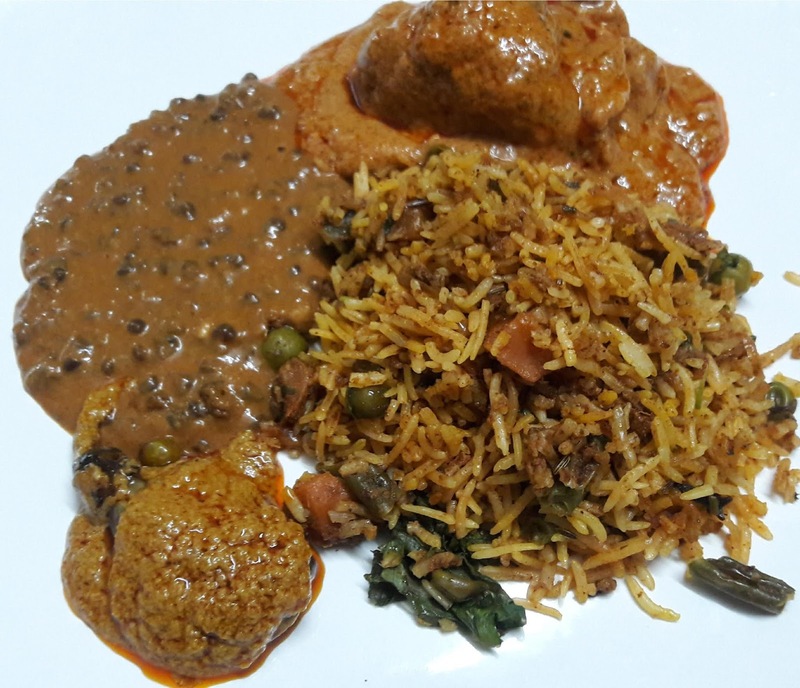 Now who doesn't like a typical North Indian meal - rotis, kebabs, butter-laden dal makhani and the works? 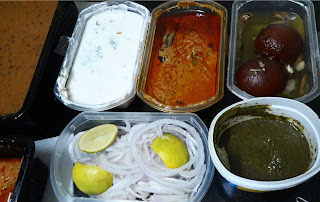 I had an invite from Dhaba Estd 1986 to review their menu at their restaurant at Ispahani Centre at Nungambakkam but was rather busy that week and declined. But the good folks at the restaurant didn't give up. They wanted me to try out their newly-launched service, Dhaba Maalgadi, were even willing to travel 11 odd kilometers to do so. Well, why not? We're sick and tired of hearing restaurants refusing home delivery because my locality is "beyond their area of delivery". 10 minutes before the appointed time, I had a call from the delivery guy who came on a bike and was actually right outside my home. 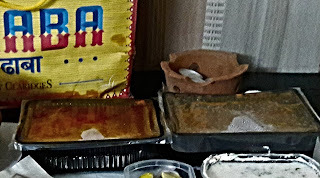 The food had been packed and placed in a paper carry bag and made it home just in time. Some oil had leaked out and the bag was on the verge of tearing. There was a butter naan, a tandoori roti, a small handi of vegetable biryani, a portion of butter chicken, dhaba dal, raita, mirchi saalan, sliced onions and lime wedges and mint chutney. Also gulab jamuns for dessert, sachets of mouth freshener and two sets of wooden spoons and forks... 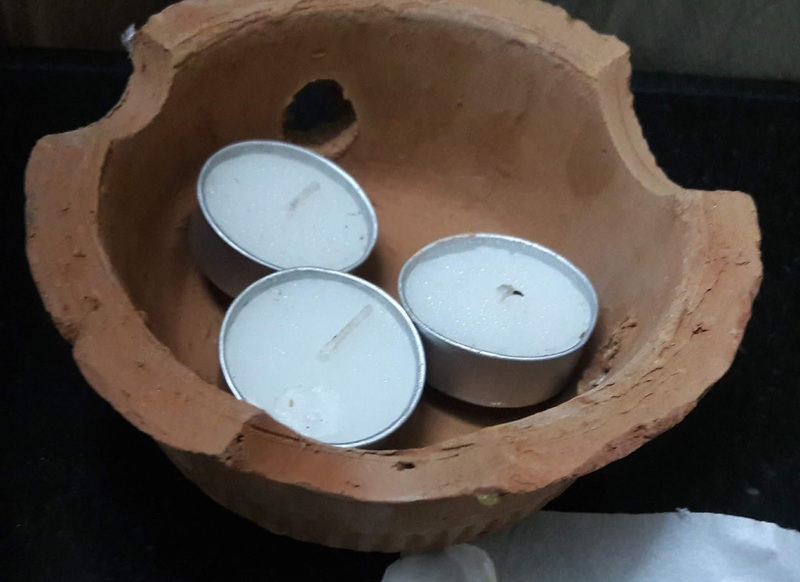 There was even a small mud pot with tea lights... phew...they thought of everything!! Every item had been neatly labelled. The rotis had been packed separately in foil packs. The butter naan was a large one and had been sliced into 3 but had become slightly rubbery. 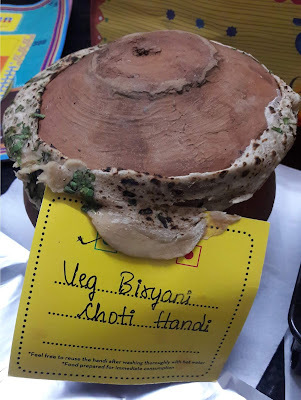 No such problem with the tandoori roti. 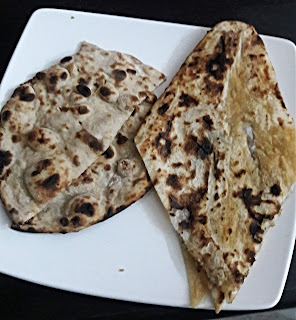 Many places roll up the rotis before packing them in foil which keeps the bread warm longer. The handi had been sealed well and the rice was still warm. 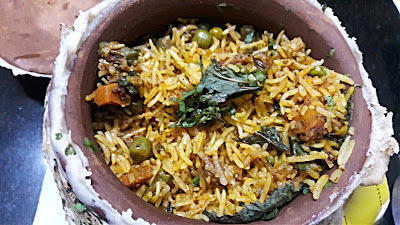 The biryani was dark coloured, had a sprinkle of coriander leaves over the top as garnish and lots of veggies like carrots, beans and beetroot. The grains of rice were long and well-cooked, we could smell the aroma of spices though there were no whole ones. Other than the aroma, it was bland. The handi came with instructions on how to clean and reuse it. 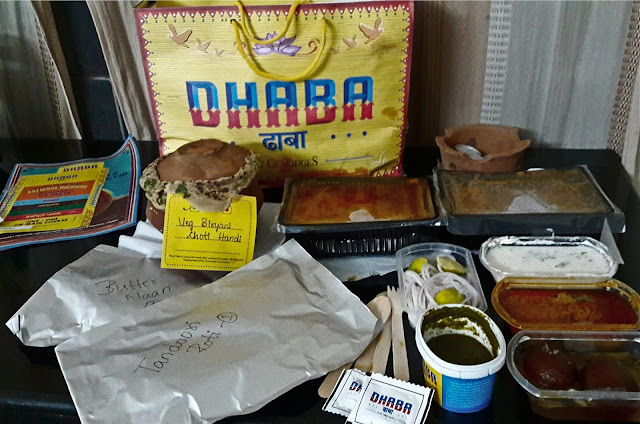 Dhaba's Butter Chicken was delicious, the creamy, spicy, red gravy had generous pieces of chicken on the bone. It had been packed in a plastic tray which had not been sealed well and some of the gravy had spilled. The Dhaba Dal was equally yummy, redolent with the flavour and aroma of butter. It was perfect with the breads. The dal was soft and the gravy thick. The raita was rather thin and the only flavour that came through was that of roasted cumin which was all right as all the other gravies were thick. The mirchi salan had fat chillies in them and an underlying sourness. The mint chutney was the clear winner, just enough tang, spice and minty goodness and it went well with both the rice and the rotis. The gulab jamun was another favourite with stuffed nuts in the centre. 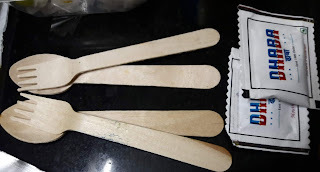 The spoons could have been of a larger size but I'm not complaining because they were not the plastic ones. It would have been good if the cutlery, mouth freshener and the paper towels were packed together. They had been spread around the bag and had picked up oil stains. The portions are definitely generous, it was meant to be a meal for 2 but 3 of us had it and there were leftovers. Overall, it was a good meal and the delivery was efficient. Dhaba Maalgadi can be reached at 7338863168.